Ask an expert about what white to drink at Thanksgiving and you’ll often hear Alsatian Gewurztraminer. We have got you SO covered today, oh yes!! OVER 50% OFF, killer 2016 vintage, gorgeous, classy, lip-smacking and wildly aromatic bottle of greatness. We’ve said this before, but you know, if you want the best sushi on Earth, you go to Japan. Not Macedonia or Morocco or Maplewood, Minnesota. And if you drink Gewurztraminer, you drink it from Alsace. Period! Say it with us! With joy and gusto: guh-VOORTS-truh-MEE-nur!!!! Ginglinger has been making wine for over 400 YEARS (the mind reels). They know every detail of great Gewurz (they make Riesling, Pinot Blanc and a delicious, killer Cremant, as well) and have honed it for centuries. Gewurztraminer has a VERY distinct nose of spice and lychee fruit. It is prized for that, and this is sooooo good. Enticing, come-hither kind of stuff. The spices range from musk to cardamom, and in addition to the lychee fruit is super-aromatic with white flowers and rose petal, sort of masculine and feminine all at once, and particularly so in the amazingly great 2016 vintage. Fresh, lightly sweet, minerally and thrilling! Complex and straight up EXCITING to drink - a refreshing (literally!) change from the norm and as we said, a MUST with roast turkey!! What a PRICE! While it lasts…! "Nose: fine fruity, floral in distinction. Palate: floral and open, mild spices are present, gentle and soft, elegant texture. Terroir: calcareous and marno-chalky." 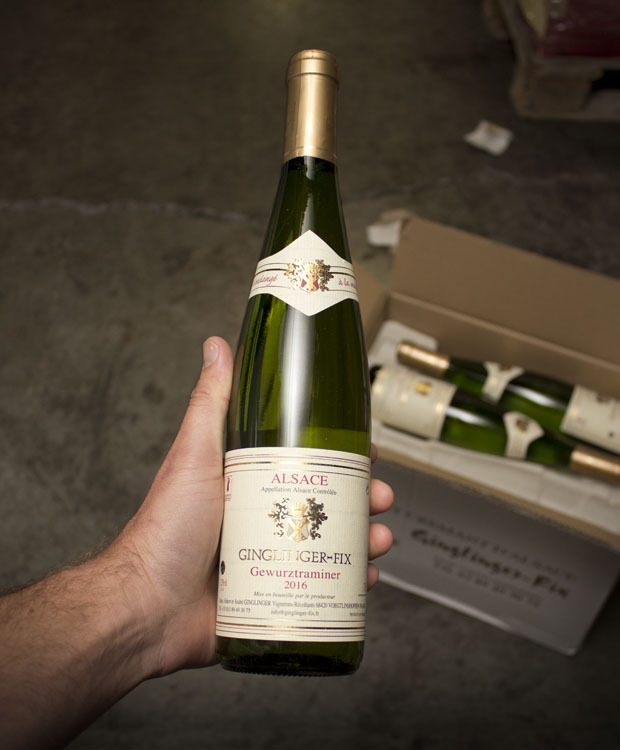 Ginglinger-Fix, located in the Alsace region of France, is a family-owned winery founded in 1610. They produce a range of Alsatian varietals, some of which are Grand Cru or late harvest. Pairs well with tandoori chicken, grilled salmon, and all spicy foods!